Is there a better alternative to Unik? Is Unik really the best app in Photography category? Will Unik work good on macOS 10.13.4? Unik is a fast and precise similar-image finder. It compares the image contents regardless of file types, resolutions, directions and color saturations. Unik compares not the binary data but the image contents, so that you can find truly similar images regardless of file types, resolutions, directions, and color saturations. Just drag and drop image files or folders or iPhoto events onto Unik. Then Unik will start comparing. You can simply add more images whenever you want. It's that easy. Unik needs a review. Be the first to review this app and get the discussion started! Options for comparing images even flipped, rotated and gray-scaled. 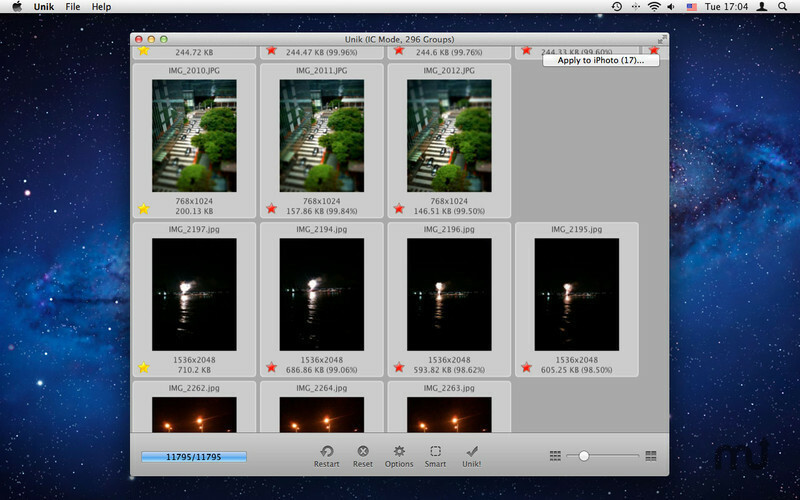 [Warning] If you delete iPhoto images directly from Finder, iPhoto Library can be damaged. When you need to edit or delete iPhoto images, please do it on iPhoto application as we recommended in the help. And comparing images over the network needs much time. We recommend to search images on local hard drive.